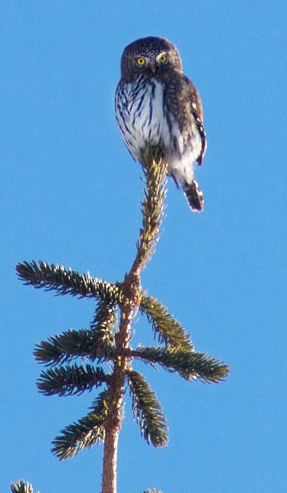 The Nicola Naturalist Society ran the Merritt Christmas Bird Count on 2 January 2011. This count, started by Wayne Weber, has been held since 1995. The weather was sunny but chilly on the 2011 count day but 15 people participated in the field groups plus 2 feeder-watchers. We recorded 58 species (right on the average) and 2050 individuals (average: 3323). Eurasian Collared Dove 34 (prev. 14) – this introduced species is gaining ground across southern BC. Some of the local feedlots were not feeding cattle – hence low counts of pigeons and other birds which frequent the feedlots (mourning doves, mallards, blackbirds). Northern Pygmy owl – second record for this count area. Cooper’s Hawk – first record for this count area. Golden Eagles (2) – always great to see. Here is the full count list.